Fake prehistoric rock art of a caveman with a shopping trolley has been hung on the walls of the British Museum. Many generations after they were etched into the sides of trees, the faces created by unknown Moriori artists on the Chatham Islands still seem to speak to us. The faces, full bodies and other designs on living trees cannot be more than a century or two old. Many may have been carved after 1835, when 900 Atiawa people from Wellington invaded the Chathams, killed about 300 of the Moriori and enslaved the rest - around 1500 to 2000 people. Uranium-series dating shows cave engravings oldest in Britain. A team of scientists from Bristol, The Open and Sheffield Universities have proved the engravings at Creswell Crags to be greater than 12,800 years old, making them Britain's oldest rock art. 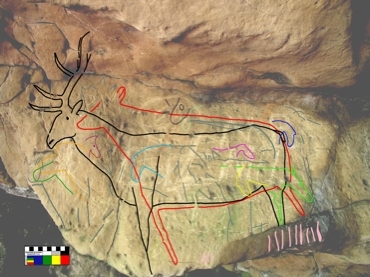 An overdrawn photo of the stag engraving in Church Hole (Photo: Sergio Ripoll). Creswell Crags which straddles the Nottinghamshire-Derbyshire border is riddled with caves which have preserved evidence of human activity during the last Ice Age. Recently, engravings on the walls and ceiling were found by archaeologists. These engravings depict animals such as the European Bison, now extinct from Britain, and other more enigmatic figures. The nature and style of these engravings led archaeologists to wonder if this art was perhaps older than any existing art in Britain ... EurekAlert! 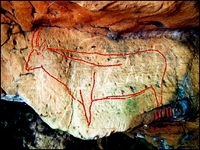 German archaeologists have given about 2 000 copies of rock art paintings, including the renowned White Lady of the Brandberg Mountain, to Namibia to help preserve the ancient art. Archaeologists working in the hills of Peru's southern coastal desert have discovered a group of giant figures scraped into the earth. The meaning of Ice Age art has been endlessly debated, but evidence is increasing that some was religiously motivated, says Paul Bahn.